Since the advent of flat TVs, manufacturers have been coming up with audio solutions that fit the new 'hang on the wall' ethos. But few, if any, have done so as comprehensively as this system. 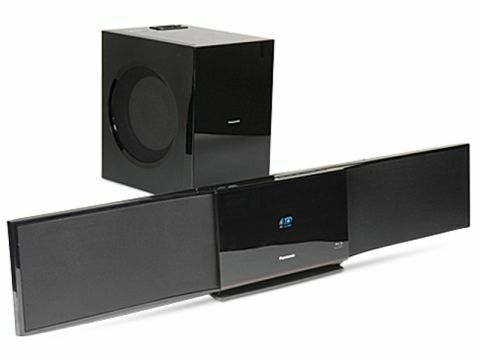 The centrepiece is essentially a long black bar, into which Panasonic has crammed two stereo speakers, a Blu-ray player capable of playing back the latest 3D discs, an FM tuner and even an iPod/iPhone dock. Also included is a chunky but nicely finished subwoofer you'll need to stow away. Happily, this connects via Wi-Fi to the main system. The bar can also join your home's Wi-Fi network to access both BD-Live functions and Panasonic's online portal. The design of the 'bar is extremely cool, especially the way a central 'door' slides right to reveal the iPod dock and left to reveal the BD tray. It only protrudes 88mm around the back, meaning it could be wall-mounted beneath your TV without looking too cumbersome. Setup couldn't be easier: connected wirelessly to the main unit and without any input from us, its HDMI output immediately shook hands with our test screens and the subwoofer. The potential of the BFT800EBK as a full media centre is enhanced by its ability to play video, photo and music files from USB devices and SD cards. The format compatibility spread isn't totally comprehensive, but the DivX Plus HD, MP3, JPEG, AVCHD and MPEG2 options arguably cover the most common bases. You'll also need to use the SD card slot to add memory to the unit, as it doesn't ship with onboard memory for BD-Live features. Disappointingly, you only get a single optical digital audio input, so people wanting to attach, say, a Sky HD receiver and games console will have to switch cables. Considering its lack of a sophisticated speaker setup, the BFT800EBK sounds pretty good. There's plenty of detailing in the mix without sounding dislocated or harsh or missing anything from the audio spectrum, while volume levels can be pushed high without distortion setting in. Most surprisingly, the subwoofer integrates naturally with the main speaker bar. I didn't experience any convincing surround sound from the system, even when using its Virtual Surround options, so it's a shame you can't add rear speakers, even if you wanted to. Also, dialogue can be overwhelmed in dense sound mixes such as those in Avatar. But with iPod music playback sounding as well-rounded as MP3s are ever going to, and the picture quality from the Blu-ray deck almost matching Panasonic's standalone 3D players.